What changes will make the 2020 Hyundai Santa Fe different? Probably very little, considering Hyundai has shelved its plan to offer this five-seat midsize crossover with a diesel-engine option. That likely limits changes for model-year 2020 to a couple new paint colors and almost certainly higher sticker prices. The Santa Fe was fully redesigned for model-year 2019, gaining updated styling and more rear-seat room while retaining carryover four-cylinder powertrains. It also dropped the “Sport” suffix from its name. Concurrently, the former just-plain Santa Fe – a longer seven-passenger crossover – was renamed the Santa Fe XL. It, in turn, is being replaced for model-year 2020 by the all-new, larger-still, eight-passenger Hyundai Pallisade. The Pallisade rivals three-seating-row midsize crossovers, such as the Honda Pilot and Toyota Highlander, leaving the 2020 Santa Fe to compete with slightly smaller five-seat midsizers, such as the Ford Edge, Jeep Grand Cherokee, Subaru Outback, and Honda Passport. Santa Fe first appeared in North America for the 2000 model year. Despite odd styling and unpolished dynamics buyers liked its roominess and high feature content at bargain prices. The second-generation premiered for model-year 2007 and catapulted this crossover into the big leagues with clean styling and greater refinement without losing its value proposition. The third-generation bowed for model-year 2013, better than ever but subject to some marketplace confusion. 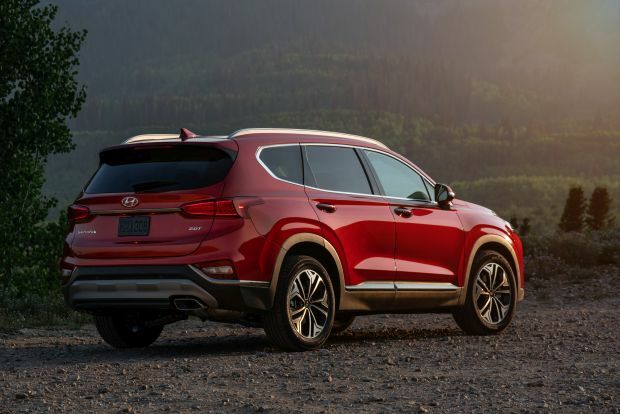 Attempting to capitalize on Santa Fe name recognition, this South Korean automaker fielded both the seven-seat Santa Fe and the five-seat Santa Fe Sport. The two weren’t separated in sales reports, but industry insiders figured 70 percent of buyers opted for the Sport. Hyundai acknowledges that making today’s fourth-generation five-seater the sole Santa Fe was intended to un-muddle things for shoppers and hopes it can help reverse a 12-percent sales dip for the crossover through 2018. Little reason to wait. The ’20 will be a virtual repeat of the 2019, but it’s a solid bet it’ll be priced higher. And it won’t offer the once-promised diesel engine, instead returning with a choice of naturally aspirated and turbocharged gasoline four-cylinders, the option of front-wheel drive or all-wheel drive (AWD), and a total of seven trim levels. Expect the 2020 Santa Fe model line to carryover. Five trim levels will again share the non-turbo engine: the entry-level SE 2.4, followed by the SEL 2.4, SEL Plus 2.4, Limited 2.4, and Ultimate 2.4. Look for the costlier Santa Fe Limited 2.0T and Ultimate 2.0T to return with the more powerful turbocharged engine. No, because Hyundai fully redesigned the Santa Fe for 2019. Five to 10 years ago, it was easy to criticize the brand for vehicles that looked too much alike. Now, it appears stylists have leeway to be more creative. Santa Fe, for example, shares its inverted hexagonal grille design with other Hyundai models, but the chain-link treatment behind the Hyundai badge is unique. Its slit-like headlamps look far more aggressive than on other Hyundai vehicles. And while the fog-light cutouts may resemble fish gills, we think they work nicely. The balance of the exterior styling is less risky, but it’s clean and functional. The taillight design has a whiff of BMW, making this mid-priced crossover look more expensive than it is. 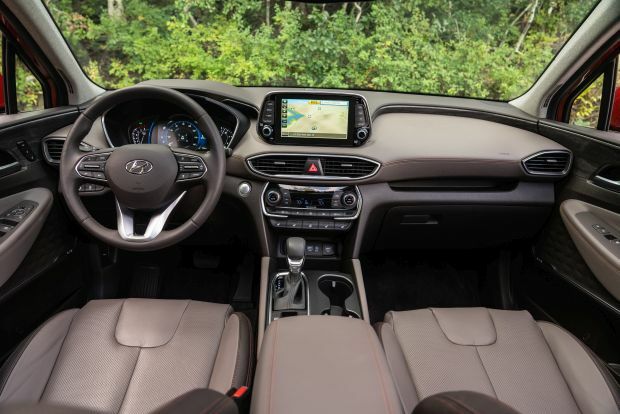 Unchanged as well should be the interior of the ’20 Santa Fe. We’d like to see Hyundai improve the quality of some interior plastics, but the cabin should remain a stylish and functional place. SE grades will again have a traditional instrument cluster with analog gauges and a basic, monochrome digital screen in the center. SEL and higher models will continue to employ a colorful LCD display that houses a virtual speedometer with customizable insert. If your budget allows, we recommend starting your search at this trim level. All 2020 Santa Fe grades will again support Apple CarPlay and Google Android Auto. A 7-inch touchscreen infotainment system will continue standard on the SE, SEL, SEL Plus, and Limited. Ultimate versions will again get an 8-inch unit that includes imbedded GPS navigation. Both screens sit tablet-like atop the dashboard, as in many new vehicles. We appreciate Hyundai flanking them with physical buttons that allow you to easily switch among output options, be it imbedded navigation, radio, or smartphone interface. Interior comfort should also return as a highlight, with cushy seat padding and surprisingly generous headroom, even beneath the housing of the panoramic sunroof that’s standard on the Limited and Ultimate. Rear-seat occupants will feel at home on the spacious bench. Even three adults fit, not something you can say about most similarly sized crossovers. Cargo capacity — 35.9 cubic feet behind the rear seats and 71.3 with the seatbacks lowered – will remain about average for the competitive set. Not with the cancellation of the diesel, which was to have been a 2.2-liter four with 190 horsepower and a stout 322 pound-feet of torque. It was originally set as a late-model-year-2019 option, but Hyundai said consumer preference away from diesels forced it to change plans. That means the ’20 Santa Fe SE 2.4 roster should return with a 2.4-liter four-cylinder of 185 horsepower and 178 pound-feet of torque. This engine is shared with Hyundai’s Tucson compact crossover. No Santa Fe with the 2.4 has been made available for testing, but it’s reasonable to expect this engine to provide little reserve power in a midsize crossover with curb weights ranging from 3,591-3,946 pounds, depending on trim level. Though it comes only on the top-trim 2.0T models, the turbocharged 2.0-liter four is our Santa Fe recommendation. Its 235 horsepower is about par for an engine of this type, but its 260 pound-feet of torque is comparable with that of the typical V-6 engine in this class. Acceleration is strong in most every situation and the 8-speed automatic transmission – the sole transmission for all Santa Fes – in our 2.0T review sample delivered timely, unobtrusive gear changes. Hyundai continues to refine its vehicles’ ride and handling characteristics. Gone are the vague steering and sloppy suspension motions that plagued previous generations of the Santa Fe. We think engineers might have tightened things up a bit too much for some Santa Fe models, though. Limited and Ultimate grades are available with 19-inch wheels and tires and don’t ride harshly, they’ll apt to be firmer than many buyers expect, especially when sharp bumps can jolt the cabin. Try before you buy and if you regularly drive on poor pavement consider sticking with the 18-inchers standard on SEL Plus, Limited, and Ultimate. SE and SEL come with 17-inch wheels and tires that absorb better still. Not likely, unfortunately. The Santa Fe could have really used the scuttled turbodiesel and because its gas engines aren’t very fuel-efficient, the turbo four in particular. With carryover powertrains, expect 2020 Santa Fe EPA ratings to repeat those of 2019. Models with the 2.4-liter should rate 22/29/25 mpg city/highway/combined with front-wheel drive and 21/27/23 with AWD. Those with the 2.0-liter turbo should return at 20/25/22 mpg with front drive and 19/24/21 with AWD. All Santa Fe models will continue to use regular-grade 87-octane gasoline. Unlikely. Hyundai could make some of the Ultimate’s exclusive items available on the Limited or SEL Plus, but the chances are slim, at best. More likely, the ’20 Santa Fe will return with each grade equipped with a set roster of features, the only factory options running to accessories such as cargo nets and trays and carpeted floor mats, all for under $200. Fortunately, the automaker did an excellent job with feature packaging on the 2019 Santa Fe and that should continue for the ‘20. Even the entry-level SE includes some rather compelling goodies, such as CarPlay/Android Auto compatibility and a full suite of driver-assistance features, including adaptive radar cruise control, forward collision warning, lane-departure warning with automatic steering correction, autonomous emergency braking with pedestrian detection, blind-spot alert with rear cross-traffic detection, and drowsy-driver alert. Heated front seats and a power driver’s seat are standard on the SEL and up. SEL Plus adds dual-zone automatic climate control and an upgraded audio system. Limited has a panoramic sunroof and leather upholstery, while the Ultimate gets ventilated front seats with driver-seat memory, heated outboard rear seats, a head-up instrument display, surround-view camera, and wireless smartphone charger. They’ll probably increase, by how much depends on whether Hyundai shuffles standard equipment. 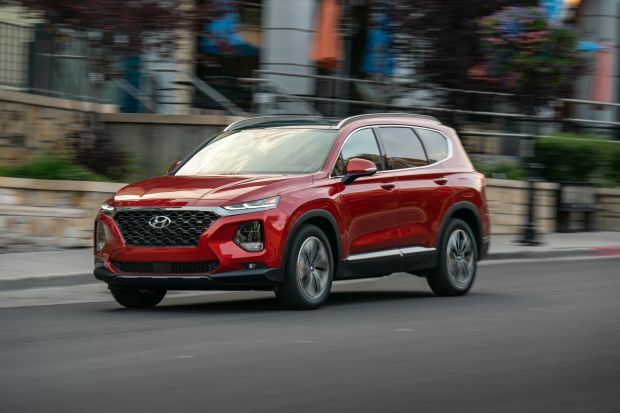 Our base-price estimates include Hyundai’s destination fee, which was $1,045 on the 2019 Santa Fe. Note that the base-price projections below are for 2020 Santa Fes with front-wheel drive. Expect optional AWD to again add $1,700. With front-wheel drive and the 2.4-liter engine, the ’20 Santa Fe SE will likely start around $26,750, the SEL around $28,750, and the SEL Plus around $31,000. Estimated base price is $33,750 for the 2020 Santa Fe Limited 2.4 and $36,500 for the Ultimate 2.4. Estimated base price is $35,500 for the Limited 2.0t and $38,500 for the Ultimate 2.0T. Expect a 2020 Hyundai Santa Fe release date in fall 2019.